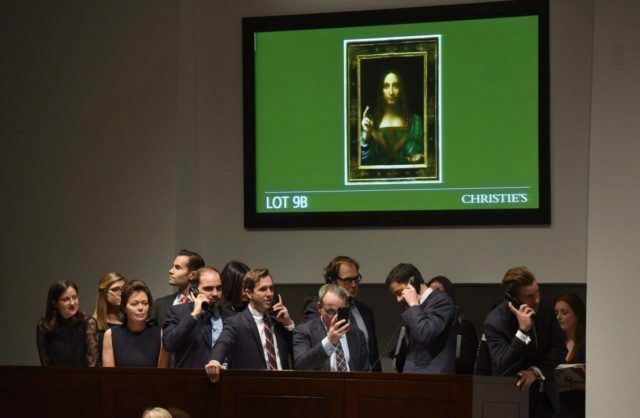 A few Renaissance art experts believe the bazillion bucks Salvator Mundi (Savior of the World), which was sold by a Russian oligarch, Dmitry Rybolovlev, — the man who bought Trump’s palm beach mansion for $95 million — isn’t a real Leonardo. They think it’s as real as the Russians meeting Trump Jr. to talk adoption. According to the Daily Mail, the thing’s been kicking around the fancy art market for the last hundred years — but not always as a da Vinci. In fact, in 1958, Christie’s’ art world rival, Sotheby’s, sold the painting at auction as a genuine Giovanni Antonio Boltraffio, (who?) for a mere 45 British pounds. That’s about $1,250 in today’s money, which is almost an eight million percent increase in 60 years. Hey — who wouldn’t want a genuine Boltraffio hanging over the fireplace? As recently as 2005, the painting sold for just $10,000 for God’s sake. Christie’s of course, stands by their authentication of the Salvatore Mundi being a genuine da Vinci — not a genuine Boltraffio — which has been cleaned, restored and perhaps painted over in some places where the paint had been scrubbed away over the centuries.